Learn more about the MSI Z97 Gaming 7 motherboard and get a chance to win a brand new MSI motherboard by reading our review and answering all of our questions in this online contest! 1. The contest is open to Filipino citizens who are currently residing in the Philippines and are of legal age. 2. Before a participant can join the contest, he or she must join HardwareZone.com.ph’s Forums. 4. Read our review of the MSI Z97 Gaming 7 motherboard. 5. 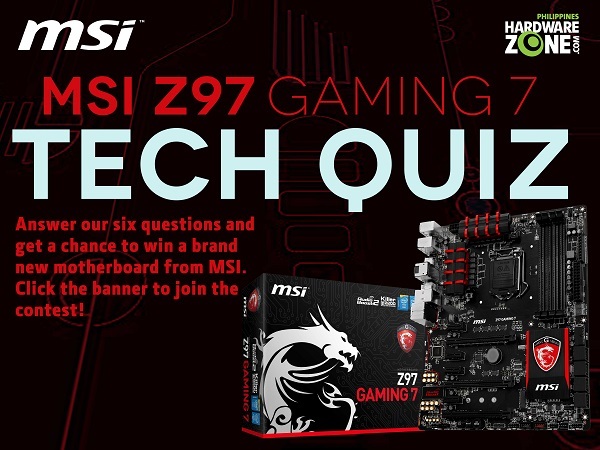 Questions related to the MSI Z97 Gaming 7 motherboard will be posted on the contest thread. Complete the questions and respond to them with the right answers. Participants who will be able to complete and answer them correctly will be qualified to the raffle. You may also visit www.msi.com to check your answer. 6. HardwareZone Philippines will announce the winner on HardwareZone.com.ph’s Forums and its social networking channels. The winner will take home an MSI H97 Gaming 3 motherboard. 7. The contest is subject to SPH’s terms and conditions pertaining to contests and lucky draws. 8. The contest runs from June 12 to June 25, 2014. Question #5: What parts are included to MSI Z97 Gaming 7’s Audio Boost 2? Question #6. What new storage interface technology is supported on the MSI Z97 Gaming 7?